We made much more this year! The Tarocco is native to the hillsides of Sicily, and is known as the most intensely flavored variety of blood orange with a distinctive 'variegation' of color alternating bright orange and blazing magenta…pretty amazing! We are fortunate to know an organic grower in the Fallbrook area of California who generously provides us with some of their precious Tarocco harvest each year. 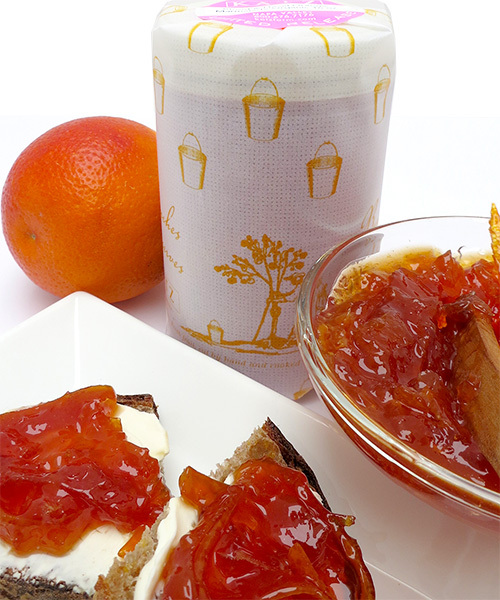 We pair them with local, organically farmed Navel Oranges from a Napa neighbor, and we add fresh lemon juice and a bit of sugar to produce a traditional style marmalade. Really bright citrus tones with a balanced sweet and tart flavor profile; thickly cut with large strips of flavorful rind. "Refreshing" comes to mind in the mouth feel with amazing depth of richness and texture. Truly special! Where did it all go, the jar is empty?